Slowdown is a project of the German musicians Constantin Gillies and Martin Suttrop. While Constantin performs piano, violin, keyboards, bass and acoustic guitar, Martin plays drums, keyboards and has also developed his technical skills during his studies of media engineering. In the beginnings they started as a recording team and as a small music production business. Their first songs were more in the acid jazz genre, but with Bossa Nova: Music & Reminiscences, which was aired on ARTE-TV in 1994, they stepped into the territory of smoother sounds. Their song Dreamaway was released some years ago on the wave music compilation Volume 4. 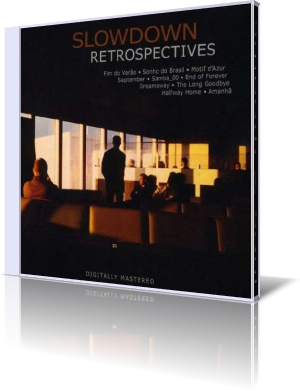 Now they have released their debut album Retrospectives on nuGroove Records (2009). The album combines elements of Lounge, Smooth Jazz with Bossa Nova styles to a lively conglomerate of groove. Starter of the album is Motif d'Azur, a swinging and swaying Bossa Nova with a great horn arrangement and intelligent sound experiments. No, your CD-player didn't crash. Dreamaway features the alluring singer Sabine Galuschka. A singer with great attraction. She is currently performing in the vocal trio Satin Dolls in Cologne. Her vocal interpretation perfectly harmonizes with the electronic layers of the sound wizards Slowdown. The atmospheric September puts us in the melancholic autumn mood. Walking through the forest, when the clear and sunny days have given way to the foggy season with spectacular show of autumn colors. The orchestral introduction of End of Forever takes this theme to a first summit presenting songstress Anke-Christin Wagner. The symphonic structure of this song recommends it for epic movies. We dive into the Latin world with Sonho do Brasil. The sultry melody is interpreted by Irina Gillies, the loveliness in person. On Samba_00 Slowdown is mixing Bossa Nova elements with Electronic fusion to a chilly tune. In the second half of the tune the strings are softening the tune, but the phase changes are still the lead theme. Despite the fact that Halfway Home is an awesome melody and Sabine Galuschka a very good singer, the sound effects and synth are sometimes over extravagant. But that's contemporary chill out, I have to get used to these sounds. Amanhã (Tomorrow) is a romantic melody in Brazilian style performed by Patricia Cruz, a very authentic Portuguese singing vocalist from Cologne. Gigi Ulrich incorporates that melancholy when we reach the end of summer. Full of memories we enjoy the last sunrays and wait with great anticipation for the next summer. Fim do Verão is the essence of these feelings. The energetic horn arrangement of Dia do Sol reminds me of the great hits of U.K.'s premium group Incognito and the rhythm of the Samba schools of Santiago de Bahia. Back to lounge with the hypnotic Together in Thoughts. This is Suttrop's signature experimental sound. Power lies in the repetition. Final songs of this album are The Long Goodbye and Fin, two gloomy pieces designated for soulful contemplation. Retrospectives is Slowdown's longtime coming and hopefully introduction to a growing fame. A difficult endeavor in a time of constantly changing music tastes.